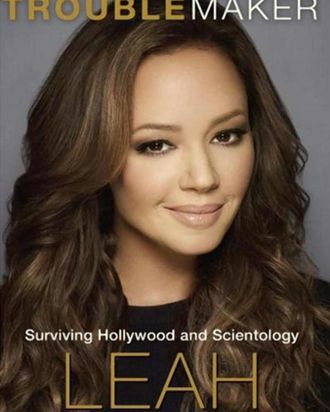 9: The age Remini was when she was first introduced to Scientology by her mother’s boyfriend Dennis. $15: The amount of money she earned per week working 14-hour days as a housekeeper at the Fort Harrison Hotel (the flagship building at Scientology’s Florida headquarters) — known simply as the “Flag” — as a teenager. $5,000: The amount she spent on marriage counseling at the Church of Scientology for her eventual husband Angelo and his then-wife. $40,000: The amount she was fined after she admitted that she used to sneak hamburgers and chocolate cake from the Flag when she worked there. $100,000: The amount required to buy books for the Inglewood Org to be considered a church. 10: The number of Armani seamstresses on hand to fix Leah Remini’s dress when she accidentally ripped it on her way to the ceremony for Tom Cruise and Katie Holmes’s wedding. $2,000: The cost of making a “picture box” for Katie Holmes as a mea culpa for ruining her wedding in Rome. $300,000: The cost to get “reprogrammed” after she was accused of ruining the Cruise-Holmes wedding. $1 million: The amount of her first major donation after the International Association of Scientologists (the IAS), the Church’s fund-raising arm, kept harassing her. $250,000: The amount of debt her other family members owed. $2 million: The overall amount she spent on services, courses, and auditing. $3 million: The overall amount of donations she made to the Church. 2006: The last year she saw Shelly Miscavige, the wife of Scientology leader David Miscavige, at a Scientology event. 2013: The year she filed a missing person’s report with the LAPD for Shelly Miscavige and officially left the Church.